This innovation showcases a typical spacy back car seat interior. The difference is an elaborate design now enables a child seat to be implemented. A prototypical clunky child car seat is no longer needed here. The child safety seat is an intricate part as it will be revealed through a simple transition. If the child seat is not needed then it may be detached or concealed. This unique invention allows the seat to face the rear for infants. If the child out grows it, the consumer simply purchases a bigger model child seat while there is no need to change the back seat of the car. Then they will attach the child seat back as it is also capable of facing forward for toddlers. I can be reached at 516-314-5562 for more info. I am looking for to reach a licensed agreement with my invention. 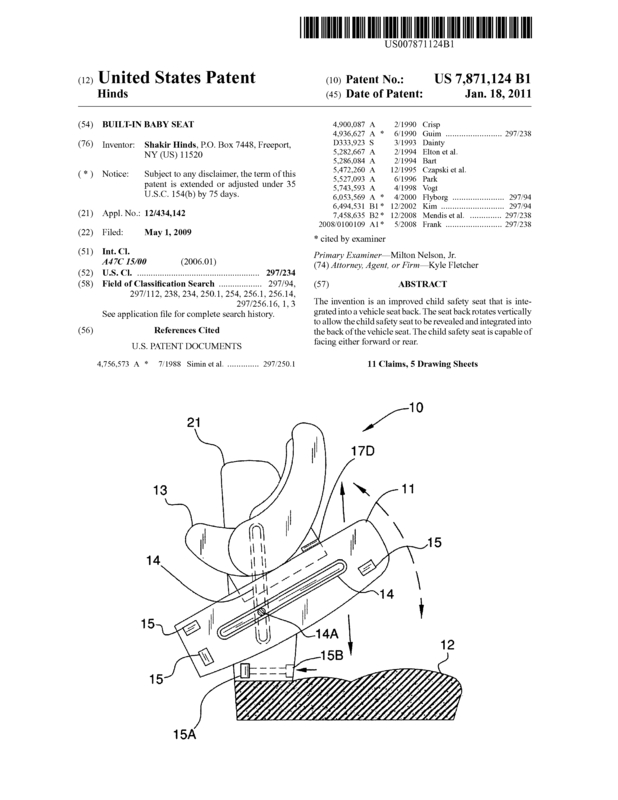 This is a utility patent that has been credited for 11 unique designs. All people with children use child safety seats which makes this very marketable. I have come up with a new concept to bring a futuristic and convenient design for the consumer. Page created at 2019-04-25 0:00:22, Patent Auction Time.